Reduce paper waste in hospitals. Environmental: less paper and plastic packaging is being used on unread magazine subscriptions. Financial: the hospital now has less paper to recycle and saves money in waste hauler costs. Administration: less time is devoted by mail services and office administration to deliver and dispose of unread and unwanted publications. Every day, countless magazines are delivered to hospitals. Many of these are addressed to physicians, who are often automatically subscribed to a number of free medical publications as a result of writing exams, going through medical school, etc. These include medical journals, pharmaceutical catalogues, medical magazines, and more. Unfortunately, doctors often do not have time for reading these magazines or forwarding them to their new working address once they change positions. While some departments with patient waiting rooms can make use of these publications, many go directly from mailboxes into the recycling bin. 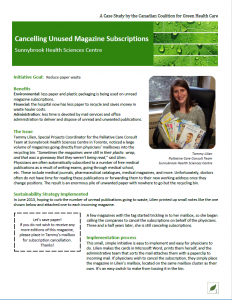 Based off an initiative started at Sunnybrook Health Sciences in Toronto, the Coalition has compiled a mini-toolkit to assist office admin staff in cancelling unwanted magazine subscriptions on behalf of other staff members. The toolkit contains a step-by-step How To guide, pre-drafted emails, tags for incoming mail, and a template for recording cancelled subscriptions. Have you used the toolkit or something similar to save paper at your hospital? Tell us about it!